Our driving recorder is an authentic "black box" for your vehicle. 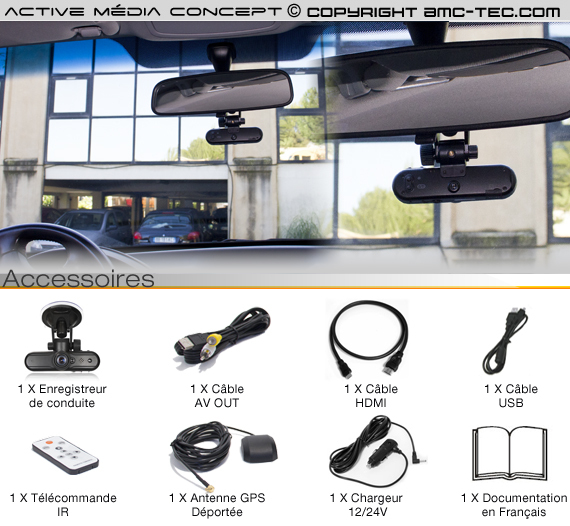 Equipped with a CMOS 5 million pixels and a wide viewing angle of 120 °, the driving camera lets you record your journeys with video and GPS track mapping via google map. 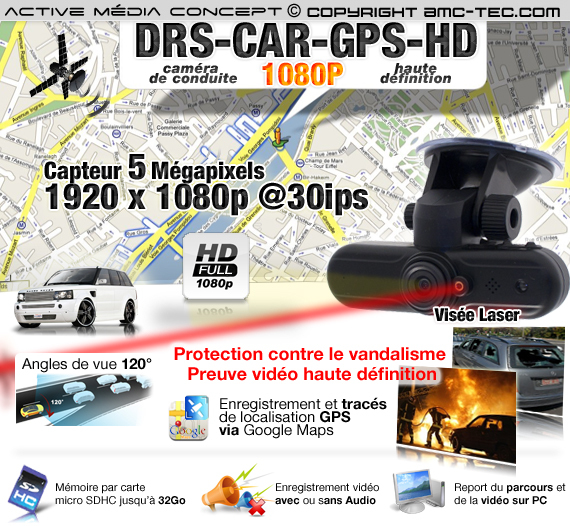 The resolution recorded by the camera of conduct is "full HD 1080p" is: 1980 x 1080 pixels @ 30 fps. You can change the video resolution by several possible resolution: 1440 x 1080p @ 30 fps, 1280x720p @ 30fps (720P HD), 848x480 @ 60 fps (WVGA). Video recordings are saved on a micro SDHC card up to 32GB of memory (not included). On each video you will be able to insert the timestamp. It is also possible to enable or disable the microphone. 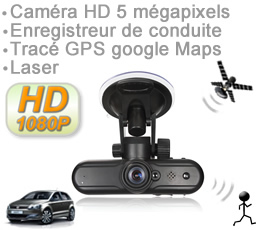 The camera incorporates a driving module GPS and an accelerometer sensor 3-axis. 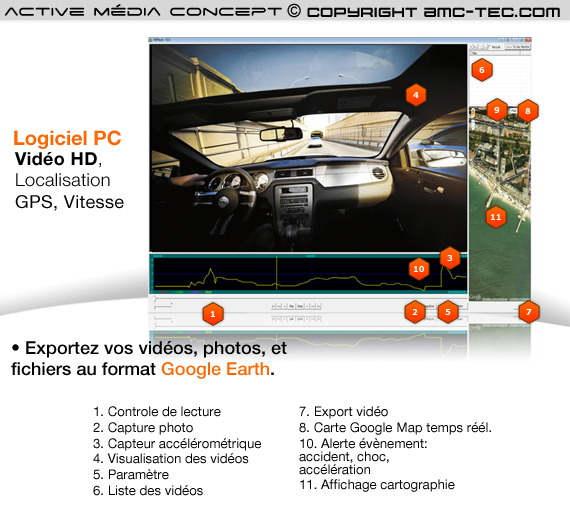 GPS track of the video recording will be tracked on a Google Map map any disturbances detected by the accelerometer shown in a curve. The accelerometer sensor allows the recording of conduct to protect the video automatically during recording, in a package or a shock. If the memory device is full, you can configure the loop mode which can record continuously and delete the old record. 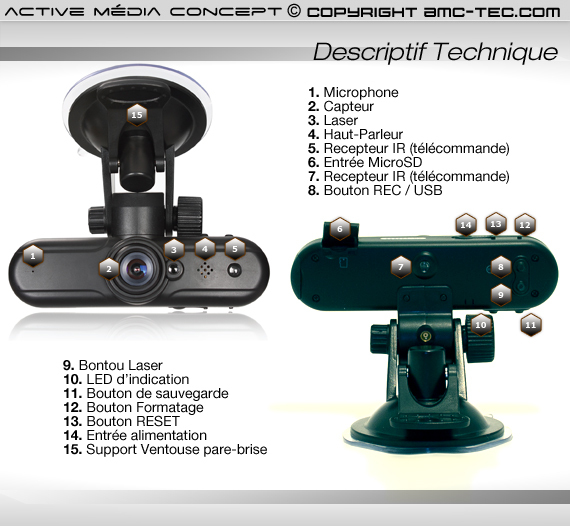 The camera sensor is the focus automatically 60 centimeters to infinity to get a picture "clear" and "net" all the time. HDMI output and an AV output on the side of the device used to connect the recorder of conduct on a screen, access the menu and to view video files saved. An IR remote lets you control the menu is set up the unit. The antenna enables the remote device mieu receive the GPS signal, it allows you to receive a more accurate GPS position. The power of our driving recorder is 12 / 24 Volts.